With the Reformation a tradition of several centuries of Gothic architecture ended in the Netherlands. Although new, now protestant Gothic churches were built in the 17th century, these were exceptions. Unlike in England, were Gothic developed further, leaving a very thin line between Gothic and neo-Gothic. When early in the 19th century neo-Gothic was introduced in the Netherlands, it was a very much inspired by English architecture, much favoured by king Willem II who had studied in England. The main characteristics of this early neo-Gothic are a purely decorative use of Gothic elements and an obvious lack of knowledge and understanding of Gothic construction. Early neo-Gothic was not limited to religious architecture only, much unlike its later namesake, which was a Catholic religious style mostly. The first time neo-Gothic was used in church architecture was when the nave of the St. Petrus in Boxtel (NB) was rebuilt in 1823-1827. Subsequent restorations and changes make it hard to judge the level of authenticity of this reconstruction, but generally it appears to have been more authentic in style than most neo-Gothic churches built in the next two or even three decades. Since architects at this time lacked understanding of the fundamentals of medieval Gothic architecture, they could do little more than merely be inspired by the ancient style and copy its elements and shapes. Often this is limited to pointed doors and windows only, or purely decorative pinacles. It was the time of governmental supervision, and churches were often built in the same cheap way as their neo-Classical counterparts. 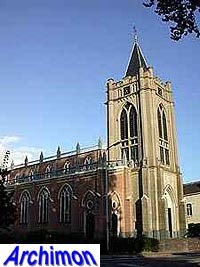 Like most neo-Classical churches, the first neo-Gothic churches in most cases have a simple one-aisled ground plan, with only a small tower at the front facade. Vaults were made out of plaster, straw and wood, and what appears to be natural stone is often wood or metal disguised with plaster or paint. Reason why this style was later often looked upon with contempt, especially by the catholics who preferred the more rationalist neo-Gothic of P.J.H. Cuypers and his followers after ca. 1850. For protestant churches the decorative style continued to be of some importance for several more decades, until being replaced by neo-Renaissance. 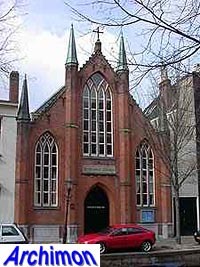 The English Episcopal church in Amsterdam (NH) was built in 1827 and is probably the first typical example of early neo-Gothic in the Netherlands. It's a radically modified cloth-hall with a facade with neo-Gothic windows, buttresses and pinnacles, while the actual shape is not Gothic at all. 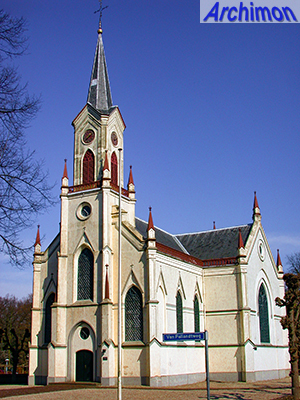 The reformed church in Zeist (U), built in 1841 by N.J. Kamperdijk, is a good example of English influence. Originally it was plastered, like many protestant churches of that time. This former Walloon-, later Lutheran church in 's-Hertogenbosch (NB) dates from 1847, and was designed by the catholic architect A. van Veggel, who was responsible for a number of both protestant and catholic churches, as well as non-religious buildings, in early neo-Gothic style. Within ten years it would become almost unthinkable that a catholic could be commissioned to design a protestant church, or a protestant a catholic one. After the catholic hierarchy was restored neo-Gothic quickly became a catholic style almost exclusively. 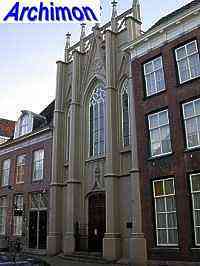 Another protestant church is the reformed church in Neerijnen (G). It's a rather late example of the early neo-Gothic style, as this church was built as late as 1865. Like many protestant churches of that time it was plastered and painted white.